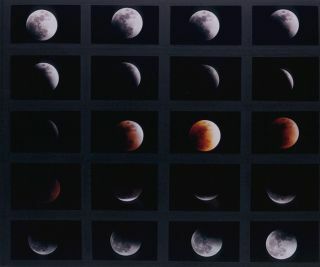 A composite of images from the January 2000 lunar eclipse captured by Victor Rogus. Victor Rogus is an amateur astronomer, and this is the third in his series of exclusive Space.com posts about amateur astronomy. He contributed this article to Space.com's Expert Voices: Op-Ed & Insights. It was Jan. 20, 2000, and the first winter storm of a seemingly mild season had struck the American Midwest. It deposited about six inches of snow, enough to cover the gray landscape in a blanket of crisp white. But the storm brought with it a burst of polar air that would send the air temperatures in northeast Wisconsin into the -10 to -15-degrees-below-zero levels. With a brisk wind chill off of Lake Michigan that would drop the mercury into the -34 degree zone, these are the conditions I would have to endure in my attempt to capture the totally eclipsed Moon with a "starry background" on film. It was a Thursday and I was needed at work, but with a fresh batch of vacation days under my belt, my intention was to set out to my dark-sky site in Algoma, Wisc., photograph the eclipse, and then take Friday off as a vacation holiday. My Jeep Wrangler was loaded with everything I needed to create a multiple-piece composite image of the moon's complete umbral display, as well as the moment of totality. I would also attempt a wide-angle piggyback shot of the eclipsed moon against its heavenly background of winter stars. This would be my first astro photo outing of the New Year and the new millennium; I hoped for a memorable night and a fine photograph or two. It was going to be a cold night, but the sky was predicted to be crystal clear, and this event would be visible over most of the United States. Many fine photographers would try to capture it. With the cold spell many were experiencing, many would be tempted to set up telescopes in the backyard and run out at the critical moment just before totality and snap off a roll of film. Because it was a work night, many more would not try at all, even if their skies were clear, I thought. In the last few days, I had been trying to conceive of a plan for creating a photographic image that is somehow different from the rest — this gives one a definite advantage in the strength of their portfolio. This is why I chose to drive 200 miles of slippery roads to the dark skies of Algoma. This is why I chose to endure the inhuman cold and biting wind of that icy great Lake's shore. Although I managed to leave work an hour early, I did not arrive at my destination until after dark. Guiding the Jeep through the snowdrifts, I found the place where I would make my stand. The drive had taken over five hours, and I was tired already. Partly cloudy skies greeted me as I exited my vehicle. Instantly the cold, night air bit the exposed skin on my face and hands, and for the first time I felt a sting of doubt. Back in the Jeep I called my wife to let her know I had arrived safely. "I'm not sure I can even do this," I said. "It's so cold and there are clouds here!" "Oh no!" She replied. "Come home, it's clear here." But there was just no way, as the umbral phase of the eclipse would begin at 9:01 p.m., and there was just no time for a change of plans. I made my bed, now it was time to sleep in it — for better or worse. Wisconsin Weather Radio was predicting clear (and dangerously cold) skies, except for extreme-northwest Wisconsin along Lake Superior where partly cloudy skies would prevail. The bright, full moon played hide and seek behind the fast-moving, but clearing, clouds while I made plans to work in five-minute shifts to unload my Jeep and set up my equipment. At this point, it was ten degrees below zero and the temperature was still dropping. First, I changed into my cold weather clothes, then steadily working while warming myself in the Jeep, I began to make progress. My telescope was assembled and my gear was organized. It was about 7:00 o'clock, I would relax for an hour, and then polar align the telescope's mount at 8:00 o'clock. The moon was climbing higher, and I could no longer see it through my windshield. My wristwatch hung over the rear view mirror, ready to time segments between exposures and I felt as ready as I could be. With a little time to kill, I placed a call to my teacher, and friend, Mark, who at the time was teaching an art class. Leaving a message on his answering machine, I told him what he was missing and how cold it was. "It's like Hell on ice," I said. At 9:00 o'clock, I begin to make my first battery of exposures — it was nearly impossible to touch the metal parts of the telescope with bare hands. Because of the strong wind gusts off the lake, I had set my tripod low to the ground and already knew that I would be crawling on the snow just to focus through the camera's back. At that point, the eclipse had begun, and I continued making exposures every ten minutes, right on schedule. The dark shadow of the Earth swiftly shrouded crater after crater. Totality was predicted to be at 10:44 p.m. CST and I felt comfortable and confident as I proceed toward that milestone. The Jeep continually idled with the heater on "high" as I attended to the business of bracketing photographs through my five-inch refractor at ten-minute intervals. Then, without warning, with about ten minutes before lunar totality, the camera at the prime focus setting of the telescope refused to work. It was frozen and the shutter would not operate. Thinking it must be broken I removed the camera from the wide-angle "piggyback" station and reassigned it to prime-focus duty — there would be no wide angle shot, the camera was needed on the main optical tube. It worked well there for the next set of photographs, and then it too failed to function, frozen solid. With my two frozen cameras in hand, I re-entered the warm Jeep to recompose myself and try to get at least one camera working again. My fingers were numb as I manipulated the camera bodies in an attempt to warm them enough to finish the job. Suddenly, one of them sprung to life, and I was instantly out the door, reattaching it to the telescope focuser. Looking up to gauge the progress of the eclipsing moon, I saw a very bright, beautiful meteor trail seem to pass right below the reddening lunar face. Soon the sky became quite dark, with the exception of millions of stars filtering into view with very little moonlight to overpower their presence. When I had first arrived here, even though the Sun had set, the bright moon light on the snow made it easy for me to see what I was doing. But now, with the Moon was nearly fully eclipsed, and it was nearly as dark as a moonless night. At the time it was hard to believe, but as I next reached for the prime-focus camera body, it dropped right out of the telescope's focuser into my hand. The small screws in the T-ring adapter had loosened and the adapter had just fallen apart. Back in the Jeep, a pocketknife served as a screwdriver to repair the unit with about two minutes remaining before totality. By now, I was low on film and decided to reload the camera for the moment of totality. As I carefully rewound the exposed film inside, the camera at times I could feel it tearing and cracking. It was so cold that the film was actually beginning to freeze and crack inside the cameras. A sample of the stress the film in Victor Rogus's cameras endured in the extreme cold. Luckily, the film held together long enough for him to obtain his images. The leaders on the film rolls would actually snap off as they went from being tightly wound around the take-up spool to a flattened position. Despite this difficulty, no images were lost — and the film only sustained minimal damage. The cold night dragged on, and the moon steadily brightened the landscape as it slipped from behind the Earth's shadow. When the event was over and the Moon was again full, I hurried back into my Jeep, where I remained warming myself for about twenty minutes. Then, deciding that there was no more reason for me to stay, I began working again in five-minute shifts, disassembling my equipment and repackaging it for the long ride home. Ultimately I realized that I had gathered enough images to create a composite photograph that would tell the entire story of the first total lunar eclipse over North America in the new century. Space.com is hosting a slideshow of Rogus's images.